The AC actually worked , not like a hotel. it over looked the water. WOW, kinda hard to point out favorite because it was all so cool. Emailed a maintenance issue that the toilet was running; Maintenance came the next morning and fixed it! We love Sunset Harbor! We've been coming for the past 7 years. The team was very helpful and friendly upon check in, when I couldn't find the correct townhouse, and upon check out. we had a great time and loved the townhouse we stayed in. We have been coming to Navarre now, for about 4 to 5 years. We love it there. We have only stayed at Summerwinds Resort, because the property and ammenities are very nice. We get together with our friends every year for a trip, so this year we brought them to Navarre-Summerwind.We loved the Condo, but, there was construction on our floor, just outside of our room. We had to breath and walk thru concrete dust to get on the elevator every time we went in and out of the room. Every time we opened our door the dust can in the room.It was all over the floor, and we had to but up with the noise of them grinning the paint off of the concrete, which started at 8:00 am. We were a little disppointed since we brought our guest. It was a two day progress.Other than that, we had a great time. The team is always helpful and very friendly! The condo we stayed in need a few things in the kitchen. Scissors, a cork screw and strainer. I was going to make a pasta salad and there wasn't one. Everyone was friendly and eager to help us check in. Front desk staff gave us tips that REALLY came in handy. Love all the smiling faces when we arrived. You are the best! 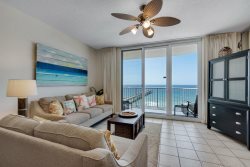 We love Navarre Beach and doing business with Navarre Properties is so delightful. The staff makes you feel important, and they are always willing to help make your stay a great one! Wish we could have stayed longer. Hope to be back soon. Thank you for sharing your beautiful condo with us. Had all paper work ready for me to sign and begin our vacation! Under the house was plenty of parking for cars, bicycles and toys for kids. in 8yrs the staff has always been willing to help in anyway, always greets with a smile & kindness. very nice & relaxing! this was my 8yr staying in 1502w & wouldn't change it. We had a wonderful time and loved being steps away from the beach. The amenities were amazing and check in was easy and fast. Condo was very clean on arrival and we look foward to staying again next year!